Equities continued retreating this week on the back of a strengthening dollar and falling energy prices. The S&P 500 fell just under 1%, the Nasdaq Composite dropped 1.1%, and the Dow Jones Industrial Average was clipped by a little more than half as much (0.6%). This week could bring more declines if the Federal Reserve removes the term “patient” from its meeting minutes and the markets interpret this as a sign of looming rate hikes. The Euro hit a 12-year low against the dollar last week as the European Central Bank officially began its bond-buying program. By the week’s end, the Euro/Dollar exchange rate fell to $1.048. 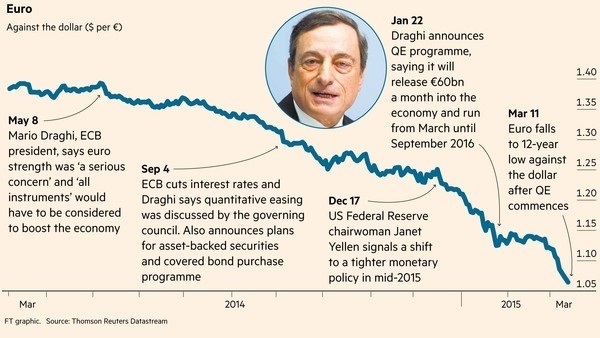 The dip caps off a 12% fall year-to-date, and puts the currency less than five cents from parity to the dollar. Many experts now expect the dollar and Euro to move toward parity, perhaps as soon as the end of April, and some think it could test the all-time low of $0.80 by the end of 2015. Gains from the stock market and rising home prices pushed the combined net worth of Americans to the highest level ever at the end of 2014. 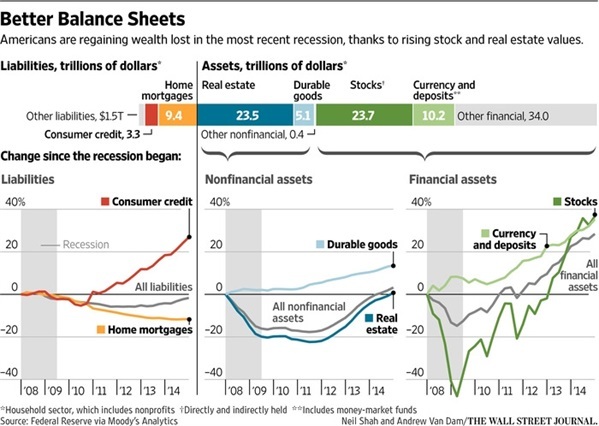 Data recently released showed the net worth of U.S. household climbed to $89.2 trillion. While this number seems impressive, it’s actually not that good of a gauge. It is not inflation-adjusted and it benefits from the natural tailwinds of population and productivity growth. A better gauge, the so-called wealth-to-income ratio, still shows net worth below pre-recession levels. America’s net worth as a percent of disposable income is 630%, compared to 651% in 2006. Interestingly, this has not topped the previous watermark despite impressive debt repayment. Total household debt is just 107% of disposable income now, down from well over 130% prior to the financial crisis. 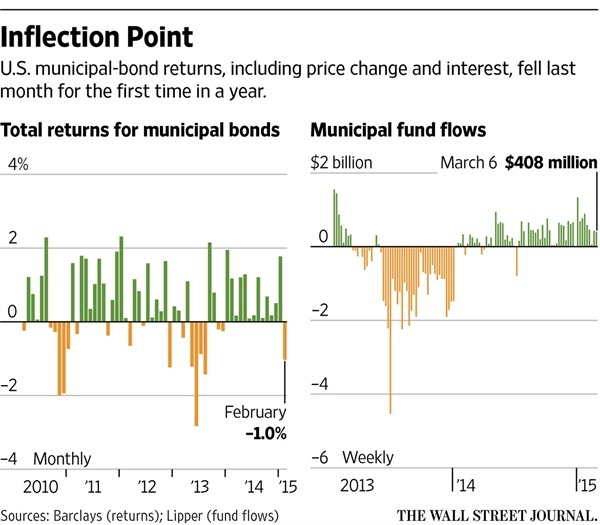 The record-tying streak of 13 consecutive months of gains for municipal bonds came to an end in February when total returns fell 1%. Year-to-date, the market has returned just 0.14%, the worst start since 2008. The total market is being pressured by new issues from cities, states and others. Through last Friday, government entities had sold more than $68 billion of bonds this year, up 88% over the same period a last year. Research from Citigroup suggests $380 billion of new issuance in 2015, up 20% over 2014. Additionally, expectations for rising rates from the Fed are keeping bond prices in check. To some experts, the market looks eerily similar to 2013 when new issuance surged in the first half of the year and then collapsed in the latter part of the year. During that year, municipal bonds disappointed when the Fed began talking about ending its bond buying program. Rate raises could create the same uncertainty and volatility in 2015 after a stellar 2014. George Washington, Abraham Lincoln and Ben Franklin all make sense. To some extent, so does Alexander Hamilton. But why is Andrew Jackson, America’s 7th President, who is most remembered for forcing Native Americans to relocate to Oklahoma on the “Trail of Tears,” memorialized on the $20 bill? Don’t worry if you don’t know the answer, no one does. Literally. Historians are currently trying to dig up the rationale since a non-profit group called Women on 20’s is lobbying to have Jackson replaced with a woman from a group of 15 candidates that include Rosa Parks, Clara Barton and Elizabeth Cady Stanton. But authorities at the U.S. Treasury Department can’t find an official explanation. Neither can the CEO of the Hermitage, a museum devoted to preserving Jackson’s legacy. Some speculate that at the time of the decision (1928) Jackson probably seemed like a good choice since he was often viewed as a champion of the everyday man and few cared about displacing tribes to give their land to white southerners back then. However, no one knows for sure and without a concrete explanation, Jackson’s time as the face of the more than 8.1 billion $20 bills in circulation may be limited. Given Jackson’s preference for hard currencies like gold and silver and dislike of paper currency, we doubt he would mind the change.